Whether you own a hairdressers, barbershop, nail or beauty salon, it’s becoming increasingly more important these days to have your own website, a digital storefront if you will. Just the other day, my fiancee announced to me that her usual hairdresser had closed up shop and moved away. Her first thought was to ask for recommendations from friends which she did. Next, she hopped on her tablet and performed a Google search for local salons in own town. For the next 30 minutes (yes, really), she browsed the various websites and finally decided on one that had a site packed full of customer reviews, examples of their work, and even allowed her to book an appointment without having to pick up the phone. That’s exactly what’ll we be aiming to achieve here with your salon site and we’ll be looking specifically at website builders that can help you do just that. 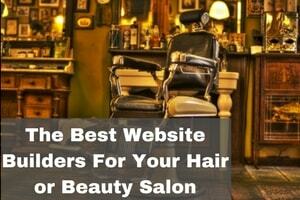 We’ll be taking a look at each of the 5 website builders that can help you create your salon site in just a moment. If you can’t wait to get stuck in, you’ll find the links below which will take you directly to the sites where you can get started right away. The homepage is one of the most visited pages of any website and yet it’s where a lot of people struggle wondering what to put there. If I was going to the local supermarket to buy my groceries then, to be honest, I could care less about the history of the company or the people that worked there. When it comes to more personal services such as hair, beauty, tattoo and nail salons etc, it’s a different story altogether. This is your chance to introduce yourself, show off your experience, and don’t forget to add plenty of images of you, the staff, as well as the salon itself so people know what to expect when they arrive. Don’t make your potential clients have to call to find out about what’s on offer. The more information you offer on your website, the more chance the customer will choose you over your rivals. This begins with a list of your services offered all laid out on a separate page. This is your chance to show off your best work from previous clients. This is where your visitors will go to see the standard and also get a little inspiration. When was the last time you made a purchase online? Did you happen to look at reviews from previous customers before you pulled the trigger on the purchase? I know I did. A few real customer reviews dotted around your site will go a long way to helping you attract new clients. The idea is to make your contact details as easy to find as possible. Create a contact page and add it to your main website navigation bar. Be sure to add your company name, address, contact numbers and even links to your social media accounts if you have them. As I said in the intro, one of the advantages of the websites that my fiancee found was that it had the ability for her to access their calendar and book an appointment directly. 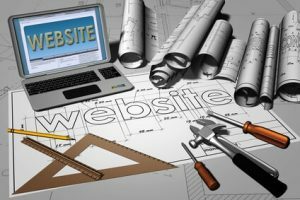 While this may sound rather technical, most website builders make it a fairly easy task these days. Don’t forget this crucial element as many people will expect you to have this feature. Have you ever looked on Google for a local business and noticed that map that pops up showing you the exact location of the premises? It’s a good idea to add a map to the bottom of each page of your site in the footer and also on the contact us page. Not only is it handy for your visitors, it could also help you pop in the search results. I’m viewing doesn’t show me prices. Definitely, something to consider, especially if your competitors show their prices. If you sell products inside your premises such as shampoo, beauty products, nail polish etc, then you may also want to consider adding an online store to your site. This will allow people to purchase goods directly without having to physically visit you. Wix happens to be one of the most popular website builders on the market and has achieved one of the highest ratings on this site thanks to its flexibility and beautiful free design templates. A good portion of these templates are dedicated specifically to Hairdressers, makeup artists, nail bars, barbershops, and spas. With Wix, you even have the option of creating your site with artificial intelligence. Yes, really! Choose Wix ADI when getting started, answer a series of simple questions about your salon and watch as Wix goes to work creating the site before your eyes. Wix offers a free website option but the major drawback is that it includes advertisements that are quite prominent. To remove these you’ll have to upgrade to either the Combo plan at $10 per month (billed annually) or their most popular plan Unlimited at $14 per month. There are also higher tier plans but one of these should meet your needs. Why pay more than you need to right? Wix Review – Learn more about Wix including the pros, cons, and pricing. Weebly’s often referred to as the easiest website builder on the market and I’d have to agree. Simply drag and drop elements around your page with the user-friendly interface until you’re happy with what you see. Another thing I love about Weebly is the App Center where you can go and find a bunch of free and paid “add ons” for your website such as contact forms, booking calendars, and testimonial features to name just a few. You won’t have to worry about the mobile version of your website with Weebly as it’ll function properly right out of the box. 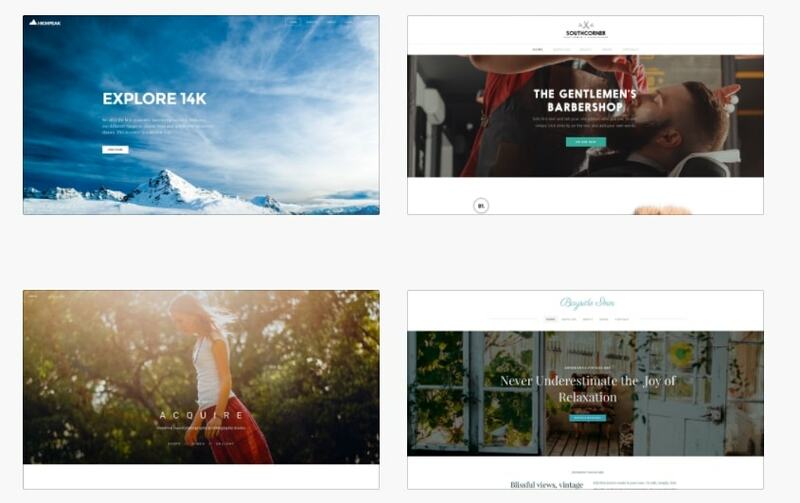 While the templates are a little more generic than Wix, Weebly does offer a “barbershop” template that you can customize to your needs as with any of the other templates. They are all pre-designed with sample content and images that you can swap out for your own to differentiate yourself from the other Weebly sites out there. Again, Weebly offers a free website option with a small ad at the bottom of your site. If you want to connect your own domain name (web address) to your site, you’ll have to upgrade to at least the starter account that’ll run you $8 per month (billed annually). If you choose this plan, Weebly will throw in a free domain name for your first year. Weebly Review – Learn more about Weebly including the pros, cons, and pricing. For me, Squarespace sits in a slightly higher class than some of the other website builders featured here. Again, they don’t have specific templates for salons but with a small learning curve, you can take a template and customize it until its unrecognizable from what you started with as I did with my test site when reviewing Squarespace. While Squarespace doesn’t have an in-house solution for a booking calendar, it is possible to integrate a third party solution called Acuity Scheduling. There’s even a full walkthrough of how to set it up. The Squarespace pricing structure differs slightly from Wix and Weebly in the sense they don’t have a free website option. Instead, you’ll have access to a 14-day free trial which should be more than enough time to decide whether the platforms a good fit for you and your business. Once the trial ends, should you wish to continue with your website, you’ll need to upgrade to the personal plan costing $12 per month (billed annually). This should be more than enough to get you started. If not, you can always upgrade again to the Business plan further down the line at $18 per month (billed annually) should you need to. Visit Squarespace – Grab a 14-day free trial with Squarespace to see if it’s the right platform for you. Squarespace Review – Learn more about Squarespace including the pros, cons, and pricing. To be honest, I’ve only just begun playing around with Hypesalons and haven’t yet got around to completing my full review. It just happens to be the only specialized salon builder on the list and while it may sound like the obvious choice for your site, these specialist builders usually come with their own set of pros and cons and so it’s not necessarily a better choice than the other generic website builders listed here. 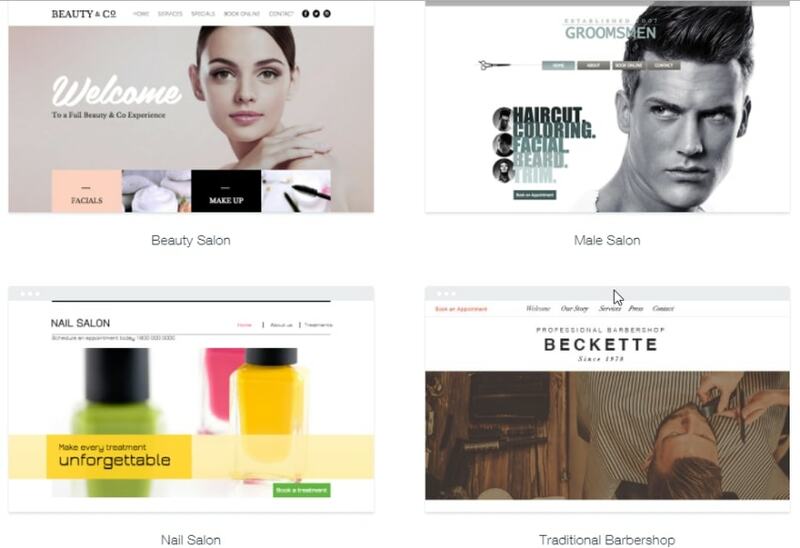 As Hypesalons focuses solely on the salon niche, it makes sense that the templates are industry specific. In addition, it was also nice to see that the user interface was fairly simple and a case of clicking on a particular section of your page which enables you to edit it. You’ll also find a built-in appointment scheduler which I’d expect with a salon specific website builder. When I first came across Hypesalons, the first thing that struck me was that it refers to itself as a “free salon website builder” but when you scroll down the page, it clearly states that it’s free for a limited time only….hmmm! After a closer look at the pricing structure, it turns out you’ll need to upgrade to either the basic website package costing $59 per year or the premium package at $89 per year. Having said that, as the basic package doesn’t allow for a mobile-friendly version of your site, the appointment scheduler, online store, or social media integration, I feel you’re almost forced to choose the premium package if you’re serious about your website. Visit Hypesalons – Sign up for a free trial with Hypesalons to see if it’s the right platform for you. Jimdo is well respected around the world and I can’t help but like it. It’s achieved a good rating here and has everything you need to create a professional salon website. 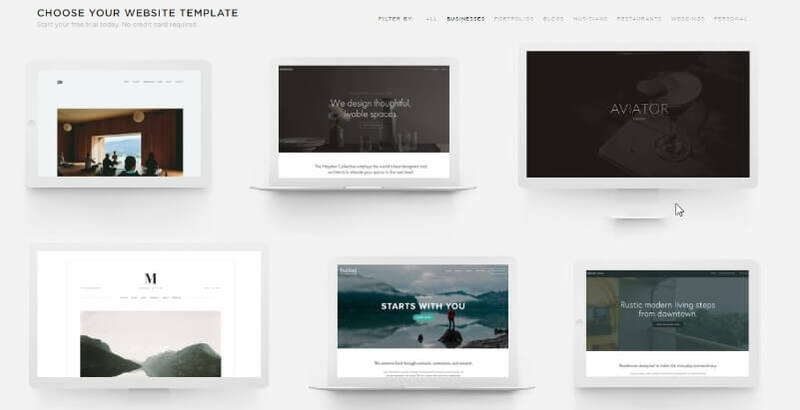 Like Squarespace and Weebly, Jimdo’s templates are slightly more generic but you can easily adapt any of them to fit your purpose by adding your own text and images. While they don’t have an in-house booking calendar, they do recommend a couple of third-party options which are relatively simple to integrate into your site and set-up. Jimdo even provides a short walkthrough detailing the exact steps required to create your salon website. Jimdo offers a very flexible free plan but if you want to upgrade your account, they offer a simple pricing structure consisting of just two plans. JimdoPro costs $7.50 per month (billed annually) and JimdoBusiness at $20 per month (billed annually). My advice, start out with JimdoPro plan as the JimdoBusiness is tailored for people looking to create an online store. Jimdo Review – Learn more about Jimdo including the pros, cons, and pricing. I hope I’ve helped you narrow down your search for the right platform for you and your business. I’ve only listed five options here but could have just as easily listed 10 but that would have only lead to paralysis by analysis. The only way to really know which one suits you best is to sign up to at least two, maybe three and take advantage of the free accounts/free trials and get to know each of them. While doing this will take extra effort in the short-term, you may just save yourself time and money in the long term. I’d love to hear which platform you chose and even see the finished result. If you have any questions, please leave them below and I’ll get back to you as soon as I possibly can! I wish you every success in your business. Is it Hard To Make a Website and Should You Even Try?